Here is a wonderful post that the lovely Michelle Johnson wrote for us as a follow up to the Flock Of Seagulls – Woman Vs. Woman. Michelle is a friend of Jennifer Laurent who writes our Conscious Living segments. She made a comment on the Seagulls post on the Stilettos on the Glass Ceiling facebook page and so I reached out to her. Michelle has an amazing vision for working with young ladies to instill the concept of promoting and supporting each other through enhancements in personal self esteem. She is working to set up a seminar in her area to start these workshops. I am honored to have her write this inspiring post, and hope this will be the first of many. Comments such as that one have led me to do a combination of soul searching and life observing. We’ve all been in a similar situation (I believe): You are in a group environment with a bunch of women you don’t know, the energy in the room is intense! Each woman is sizing the other up, forming judgments, feeling envious, giving the stink eye, etc. The cocktails start kicking in (always helps to break the ice) and the girls begin to relax and let their guard down (it is particularly helpful if men are not present). It is only then that we are able to connect on a different level and realize, we really do have things in common, we don’t need to compete and we can admit that we love ‘her shoes,’ or say openly we wished we had beautiful wavy hair like ‘that girl,’ and a sort of love fest happens! When I observe these types of scenarios, it’s obvious that we really have the natural instinct to want to bond together, not to be separate and alone. That when we let our guard down, we can see each other as we see ourselves. (Hello ‘sweet girl’!) Women are so complex! We are the perfect blend of compassion, drive, love, tenacity, gentleness, courage, humor, sweetness, etc. Each to a different degree than the next, and all for the evolution of our souls. I propose that we band together as a ‘sisterhood’ and strive to see the strengths in each other, and that we teach our daughters, sisters, nieces, cousins from a young age to do so as well. I say that it’s high time we unite and uplift each other rather than tear each other apart. We don’t have to be best friends with every woman we meet, we only need to be at our best. They will see the best in you, recognize it in themselves, and then give their best in return. As a Life Coach and Hypnotherapist, I am drawn to inspiring others and guiding them to discover the best and most beautiful parts of themselves. My passion for the unity and empowerment of women has drawn me to promote this ‘sisterhood’ mentality through the development of clubs, workshops and conferences. These avenues will not be an ‘in your face, preach it from the pulpit’ approach, but rather have an underlying tone and message at their core as well as to communicate other useful and relevant insights. My dream is to work with girls from pre-teen through college age, working women and stay-at-home moms alike! I hope that by addressing this issue of unity at all ages and phases of life, the message will spread cross-generational and will ultimately be the mindset of our nation, and dare I hope and pray eventually of the world. With our innate power, ingenuity, and ambition coupled with our ‘softer aspects,’ we as women are so amazingly capable! 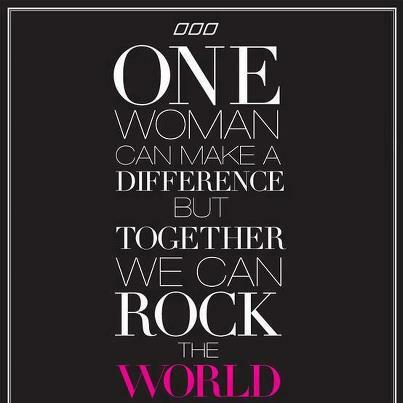 Even in a ‘man’s world’ we can accomplish more as women if we band together than if we remain separate. Can you imagine the difference we can make in our world, our community, our company, and our schools if we focused on supporting and uplifting one another instead of tearing each other down? We succeed when we stop viewing each other as competition, and instead unite and recognize that we are all unique and no two of us can ever be exactly alike! That we are each here to share our special and distinctive talents with the world. Let’s celebrate our individuality and cheer each other on. There really is room at the top for all of us! In these crazy times, it’s important to remember that we cannot be at odds with each other in any way, shape or form and expect to be successful! This statement proves true whether you’re a couple, family, corporation, gender or country…the truth is… United we stand, divided we fall.